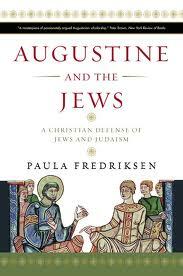 I introduced the discussion of Augustine and the Jews: A Christian Defense of Jews and Judaism by Paula Fredriksen here. “The roots of Christianity run deep in Judaism. And the roots of anti-Judaism run deep in Christianity.” Thus begins Fredriksen’s introduction to the first part of her book. To flesh out in fullness the relationship of Augustine to these two facts, Fredriksen provides the scope to her book as she begins her first chapter: “Understanding the traditions of Christian anti-Judaism, in order to see how Augustine’s ideas on Jews and Judaism ultimately challenged them, begins with an understanding of the world in the wake of Alexander the Great” (1). But first, back to Augustine. Contrary to popular belief, Fredriksen notes that Augustine’s father was Christian, though not baptized until the end of his life. Usually it is said that Augustine’s father was a pagan. His mother was a “fervent believer” (3). With a father who was pagan or not, Augustine definitely grew up in a thoroughly pagan world in North Africa in the middle of the 4th century. Fredriksen highlights how he would’ve learned much about classical gods such as Juno, Zeus, and Athena in his formal education. This question is answered by looking at the world that gave rise to this form of education, i.e., the world of Alexander the Great (3). Nearly seven centuries before Augustine, Alexander conquered a vast stretch of the eastern world. The international culture he instilled alongside his reign is known as Hellenism, a system of Greek thought, language, religion/politics, etc: “the West’s first great experience of globalization” (4). It is this very system that gave rise to the Septuagint, the Greek translation of the Hebrew Old Testament which the New Testament writers most often quote and allude to, and apart from which it would be hard to imagine how Christianity could have gotten off the ground as a largely Gentile (i.e., Greek-speaking) movement. Hellenism brought many different types of people together, and different peoples had their different gods. These gods were therefore brought together into closer and more common contact (5-6). Fredriksen describes the ancient world populated by two populations: gods and humans. These gods lived in heaven much of the time, yes, but they also lived on the earth, localizing around holy sites whether natural or manmade. A primary manmade example being a temple. A god dwells in his temple, and Fredriksen directs us to Matthew 23:21 as a handy Jewish example of this view (6). In or around this holy site of the god’s presence would that god meet with his people, and often they would “eat” together. Satisfying the god in proper cultic piety, the worshiper would bring an animal, cereals, wine, etc. before the god. But this was not the only way gods were located within a certain sphere; they were also located among their peoples. In other words, a person would receive a certain god by being born in a certain family. “In antiquity, gods ran in the blood” (7). In talking about all this ancient stuff, Fredriksen notes her hesitance to refer to it as “religion.” She uses that word in scare quotes because of the way that the typical reader of her book, the modern Westerner, would understand it. For our culture, Fredriksen writes, “religion is a detachable aspect of individual identity. Largely personal or private, modern religion seems first of all a question of beliefs. And beliefs themselves often relate to individual psychological states, the sincerity of commitment or conviction or inner disposition of the believer” (7). She continues: “In the ancient Mediterranean, by contrast, the closest social analogue to our concept of religion would be cult, those protocols and practices whereby humans enacted their respect for and devotion to the deity, thereby securing heaven’s good will. Cult focused on deeds. It was communal” (7). Probably without even meaning to, Fredriksen has brought up an important lesson for contemporary Christians in the Western world. Many of us think of religion as being made up those things that we believe in our privacy, or worse, those things that we may somehow believe but don’t affect to any respectable degree what we do out in the world. Now, modern religion (most of the time) has no cultic aspect to it–I don’t think people are out there sacrificing animals. But, I think that we mistake religion, and most importantly for me and my context, Christianity, as being private. Personal yes, but private, no. Religion has historically not been something that you do by yourself. It is not just belief, it is deed. It is not just private, it is communal. This communal aspect doesn’t just reflect how gods would be worshiped publicly, which they would’ve been, but also how, as she says, “gods ran in the blood.” Gods were then ethnic, just as their respective peoples were ethnic. Entire cities, then, whose citizens were descendants of a certain god could benefit in their relationships with other cities from “invoking newly discovered bonds through ancient divine-human relationship” (9). Fredriksen contrasts this idea of being offspring of gods that was common among pagans with the Jewish God, who in no way coupled with humans. Still, “He had children nonetheless.” Those called children of the Jewish God are those who are intimate with him in a completely non-sexual relationship. Still, the Jewish God ran in the blood. So much so that his people composed an entire race known as the Jews (9-10). In this ancient world, therefore, just as all sorts of different people ran into each other at different times, so did their gods. However, don’t make the mistake of seeing the nature of their interaction as “tolerance,” Fredriksen warns. It’s not mere tolerance; it’s pluralism. Related to this point is a vital one for moderns to face if they are to understand the religious world of antiquity: “the existence or nonexistence of the gods of outsiders … was not at issue. Ancient peoples generally assumed that various gods existed, just as their humans did” (10). If I remember right, it was Larry Hurtado (a Christian New Testament scholar at Edinburgh) said at a SBL conference session on monotheism I attended that ancients knew when gods existed if there people sacrificing to them. Not only does this underline the basic importance of the cultic aspect of ancient religion that Fredriksen highlights, it also shows that existence of gods in antiquity was generally assumed. Now this is not now modern Westerners are accustomed to thinking about the issue of the existence of gods, and it rightfully comes as a shock to those who realize for the first time the distance that is in place between ourselves and the ancients in this regard. More shock comes when we see it in the Bible. “Who is like you, O Lord, among the gods?” praises Moses in Exodus 15:11. God commands “You shall have no other gods before me,” in Exodus 20:3. Fredriksen cites these texts and others like them such as Micah 4:5 as evidence that Israel accepted the existence of other gods. This came to them as part of their culture. It’s simply the way people thought back then. Though Fredriksen believes this belief persists well into the New Testament period and can be seen even in the writings of Paul, I discern a transition period where Israel began to believe that other gods weren’t just lower than YHWH their God–they didn’t even exist. I differ with her on this point but I have no problem granting that the ancient Israelites believed that other gods existed. I think God speaks with us in light of our situations, be they historical or cultural or religious. His revelation is unveiled progressively, and so I don’t see any reason why we should reject the idea that God would grant for the sake of argument, as it were, that other gods existed in order to tell his people that they shouldn’t worship them. Whether it was existing gods or non-existing gods or tree fungus–Israel was to worship YHWH their God who brought them out of Egypt and him alone. So back to the idea of pluralism. This was the nature of ancient religion. And ancient civilization reflects such a religious idea. Whereas moderns tend to think of cities as areas of big secular space, it was exactly the opposite in antiquity. Ancient Mediterranean cities were, Fredriksen notes, “religious institutions” (13). Displays of religious devotion–remember, this means sacrifice–were public and demonstrated one’s responsibility to one’s city. Happy gods = prosperous cities. If there was horrific drought, or disastrous floods, this meant the gods were not happy and were therefore not being treated properly by the citizens (14). Another aspect to this civil-religious-public-cult thing of the ancient world, is the cult of the ruler which was introduced by Alexander and perfected by Rome in its emperor cult. The Roman emperors were seen as heaven’s special divine agents on earth. When they died, they were translated to heaven (in antiquity not everyone went to heaven after death) where they continued to serve the empire (14). The cultic treatment they received helped to bind together not only the citizens of the empire but heaven and earth as well (15).